Cardinal Neurosurgery & Spine, Inc., was founded on July 1, 1999 to serve patients of St. Louis and the surrounding Missouri and Illinois regions. 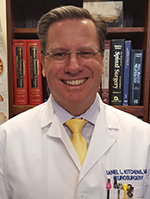 Dr. Daniel Kitchens and staff offer a full range of neurosurgical services combined with constant attention to excellence of care. Dr. Kitchens is board certified in neurological surgery and is affiliated in St. Louis with Missouri Baptist Medical Center, Des Peres Hospital, and Frontenac Surgery and Spine Care Center. His activities outside of his practice and family life include sailing and tennis.